NEW VIDEO!!! If you are trying to eat super healthy, this dish will blow you away with how unbelievably flavorful and satisfying it is! Paleo, Whole30 friendly, Gluten, Dairy and Egg-Free! ***FYI: This is an update of an old post, (I added a video because I love the recipe so much!) so the post below is a throwback and from over a year ago! Wow what a loooong weekend. Pia and I made it to Beaverton and back in one piece! We had two days on the fencing circuit and Pia took home a 5th place medal in the Y10 division, and had quite an experience fencing in the Y12 division against mostly 7th graders that were pretty much the same size as me (I’m not a small person!) Her eyes were round as saucers when she realized she was fencing these girls (she is a pretty small 9 year old) but I was really impressed with how she handled herself, knowing that it was all about the process and that she was there to learn. In all, it was a great experience and I am so glad that I took her down there. I came home to a flurry of baking, cooking dinner and helping the girls work on a star of the week poster (Coco) and a solar system project (Pia). I am worked. Like SO tired. I’m going to Vegas in 10 days, and my mom break can NOT come soon enough! Ok, also, you know the drill when you are traveling, road tripping- anything like that where you are out of your usual routine and prone to massive snacking (like I ate 12 Kind bars this weekend. Seriously. I think I had 12) – you just want to get back into a healthy way of living. 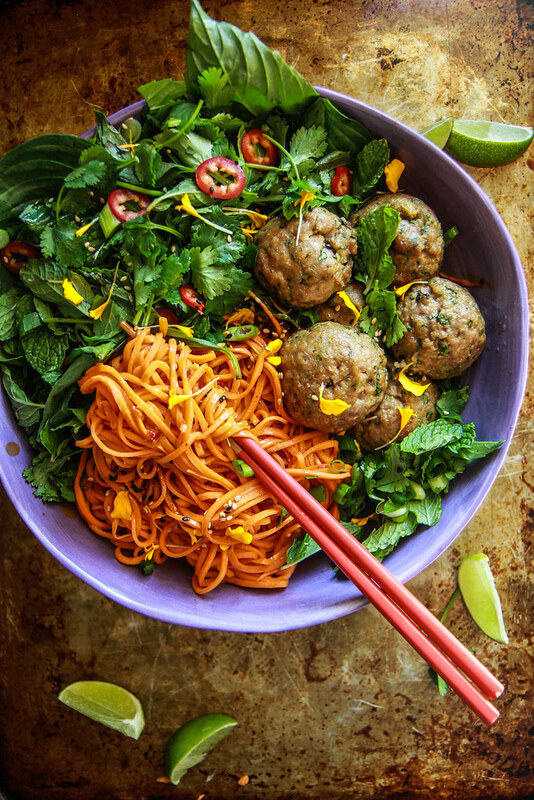 So I am kicking my Monday off with this delicious Asian Sweet Potato Noodles with Pork Ginger Meatballs. I made this a few weeks ago, and it was honestly so good that I have made it once since then and am making it tonight for dinner. It’s so incredibly flavorful and I love how high in protein it is, not to mention healthy!! This dish (as always) is GF, dairy and egg free and Paleo and Whole30 friendly. Enjoy! Quick note! My Facebook Live Cooking Class schedule has moved to a regular time (Finally!!) EVERY Tuesdays and Thursday at 11am PT over on the Heather Christo Face Book Page. On Tuesdays I will show you a new recipe and Thursdays will be “Thirsty Thursday” Where I make a delicious cocktail or mocktail for you ☺ See you there! Preheat the oven to 375 degrees. Prepare a sheetpan with parchment paper. In a large bowl combine all of the meatball ingredients, mixing the meat and everything else together well. Form the meat mixture into 16 meatballs and place them evenly spaced on the prepared sheetpan. Bake in the oven at 375 degrees for 12 minutes. While the meatballs are baking whisk together the Asian Sauce ingredients and set aside. In another bowl, lightly toss together the Fresh Herb Salad ingredients. In a large dry pan or skillet over medium-high heat add the sweet potato noodles, tossing them with tongs as they start to soften. Cook for about 1 minute and then add the sauce to the noodles. Toss and cook for another minute or two until the noodles are just slightly softened and well coated with the sauce. 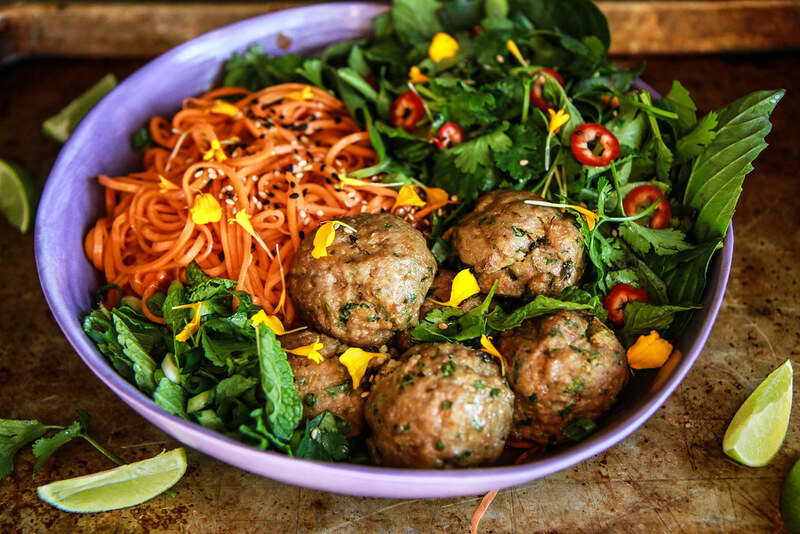 Dish the noodles into bowls and add a heap of the fresh herb salad and a few meatballs and serve immediately. 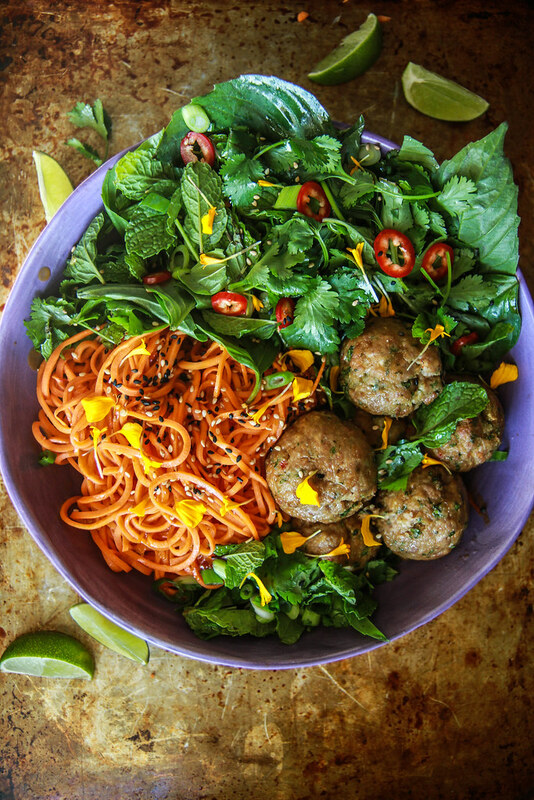 These meatball and sweet potato noodle bowls look so good! wondering if you can use bread crumbs in place of the dehydrated potato flakes. yes- that would probably work well Judy! I was going to ask what our potato flakes? The only thing that comes to mind is instant potatoes that we used as a kid when we went camping. lol! Those would work Tracy! You just want dehydrated potato flakes. Heather, this dish looks amazing! I can’t wait to try soon! Just finished making and eating this! Soooo flavorful and good! And I am not typically a healthy eater but I’m trying. The meatballs were perfect. The sweet potatoes were a little spicy but I think I had small potatoes and a lot of sauce. This is definitely going to be a regular meal. Thanks!! Awesome Sylvie! I am trying really hard to send you guys lots of recipe like this where it is 1) delicious and satisfying and 2) oh yeah, it’s healthy! Glad that you liked it and feel free to tone down the spice next time! i’m totally obsessing over these pork ginger meatballs! oh awesome Ashley!! I am so happy that you liked this, it’s a current favorite of mine too! Just curious, do your kids like all the herbs? I do, but I’m the only one who does. Is there mod herbs to introduce to my family, or just keep trying? Thanks! This looks so yummy! Sorry should read any mild herbs. This dish is outstanding! I really love the flavor profiles and textures, even the sweet potatoes, something I’ve never been fond ot – definitely a winner! Hi Heather, new to your site. This dish was perfectly balanced and had a crazy good amount of flavor. I accidendly left out the potato flakes from the meatballs and, while expectedly more dense, still came out fabulous!! Really, well done. Thanks a bunch. Thank you so much Chrissy- really glad that you like the dish! This bowl is right up my alley! Love the new video! Seriously the PERFECT dinner!!! So making this! Loving the sound of this meal! That meatball and noodle combo sounds AMAZING! These look fantastic! My big woe here is an allergy to sesame seeds (and all other seeds and nuts) – can you think of a substitute that might impart a similar flavor without all the silly face-swelling and not-breathing? Thanks! Fair enough Carla! I deeply sympathize, I have quite a lot of bizarre seed allergies that peskily suffocate me. I would just ommit the seeds and swap the sesame oil for vegetable oil. What a winner of a dinner this was! It was very easy to make and super flavorful. I will definitely be making this one again soon. This sounds amazing. 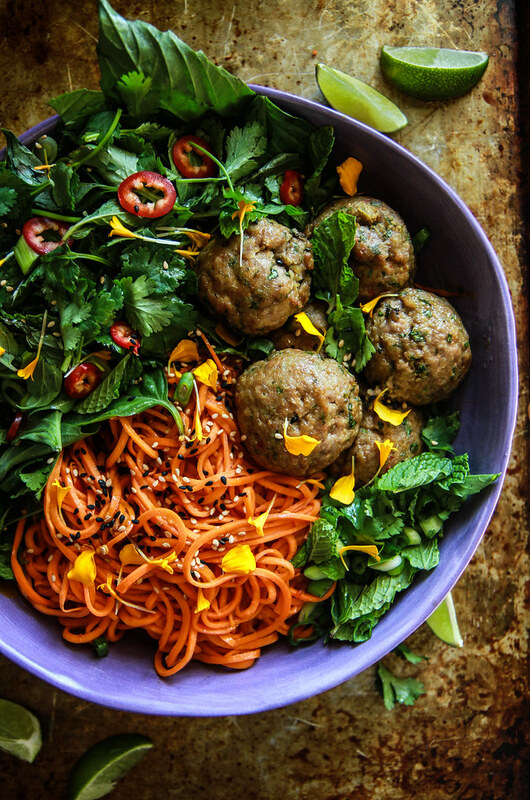 Love this ginger pork meatballs with the sweet potato noodles!